Visitors to the Quaker Settlement always remark on the beautiful layout and design of the buildings and surrounding natural features. Eco-design features are prominent: all the dwellings face north and optimise passive solar heating from the sun; building footprints minimise water run-off by using green lawn and garden spaces (which also create beautiful amenities); and building construction methods focused on environmental friendly materials that combined efficiency, frugality, and aesthetic attractiveness. This tradition is being expanded to meet new legal requirements relating to insulation and warm homes. All rental properties throughout New Zealand have to meet new healthy homes standards by 1 July 2019. The dynamic nature of the living arrangements at the Settlement means that there will always be rental houses occupied by tenants, and for the past 12 months, WEST (Whanganui Educational Settlement Trust), together with settler representatives, have examined how the new legal requirements could be implemented using Quaker and eco-design principles, along with state-of-the-art technical knowledge and know- how. The underlying principle for the project focused on health and well-being of people renting dwellings in the Settlement. Given the challenges of retrofitting insulation into existing houses, it may have been feasible to seek exemption from the new standards, but this was not considered appropriate given sustainability objectives that underpin all activities at the Settlement, and the importance of adopting best practice in all aspects of Quaker living.The insulation group from WEST and the settlers included Michael Payne, the original Settlement (award winning) architect, and Jason Quinn, one of New Zealand’s leading building energy efficiency practitioners. They provided a superb technical background for both analysis and project design of the ceiling insulation requirements, and came up with skilful and innovative ways to place new insulation into the ceiling cavities. 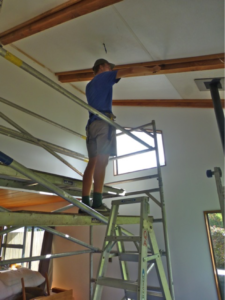 Jason modelled the heat loss from dwellings (30% through the ceilings), and followed up his ‘desk-top’ analysis with a new technology that seals buildings and then identifies gaps and areas where the heat loss is occurring. The placement and insertion of the insulating material posed additional challenges and required the technical skill and creativity of Martin Payne who has been linked with the Settlement for decades, and is a qualified engineer with a great array of practical building talents. 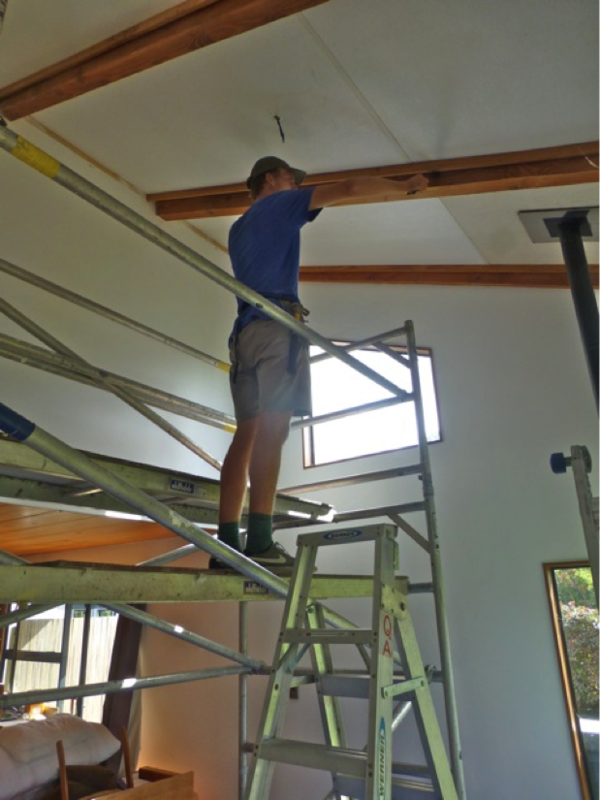 Martin and Michael researched and purchased foam insulation that met high environmental and energy efficiency requirements, while Martin, the project installer, accessed innovative ‘state of the art’ equipment to ensure the new insulation was ‘air-tight’. 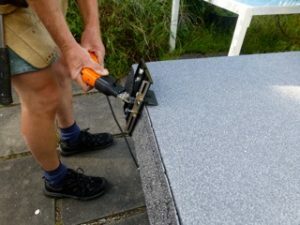 A bonus of the choice of insulation foam material is the willingness of the Auckland manufacturer to take back all insulation offcuts for re-use in new panels. 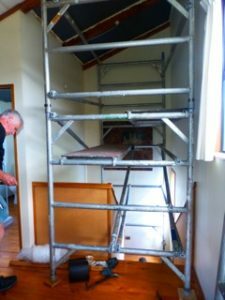 Given the height of the ceilings, health and safety requirements were paramount, and scaffolding borrowed from a local builder was required. Project management also included working around household furniture and the willingness of tenants to move out of their homes for a few days during the installation process. The new healthy homes insulation requirements will affect over half a million homes. 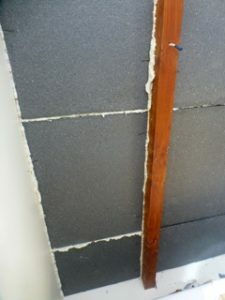 Retrofitting insulation material into ceiling cavities will be a relatively easy process where ceilings are flat and easily accessible; but as is the case of the buildings at the Settlement, they will also involve far more challenging and complex arrangements. The importance of thoughtful creative thinking, underpinned by Quaker values that embody environmental concerns, health and well-being, long term thinking, and working for the common good. The Settlement was founded on visionary practical values that have stood the test of time. This latest challenge provides another accretion and layer of initiative and quality that will endure in the years ahead. 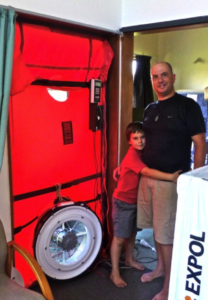 The insulation project will, over time, extend to all dwellings in the Settlement. The costs are considerable, so the Settlement is very thankful for funding from Trust Board agreed to at Yearly Meeting 2018. Thank you all!